There's no better race track to bring us back from the summer break than Spa-Francorchamps. Historic, legendary, a challenge for drivers and a beauty to look at for spectators, it has a little bit of everything. After four long weeks without Formula One, everyone is back, refreshed and ready for the second half of the season. Teams have everything to play for as the championship winds its way to a conclusion, and the championship battle remains open - within the top two, anyway. Nico Rosberg leads the championship with eleven points over Mercedes teammate and rival Lewis Hamilton. It's the biggest the gap has been for a while, and the tensions were really getting high between the pair. Perhaps the summer break will have softened them, but more likely it's going to continue to be a strained relationship as things get really serious. Further back, Kamui Kobayashi has been replaced for at least this one race. The Caterham will be piloted by André Lotterer who has spent time endurance racing and winning Le Mans. The team have said Kamui is still contracted, but it can't be a good sign to sit out a race. You'll get no points for guessing there will be rain this weekend, it's usually damp at some point during the Belgian Grand Prix weekend. This year, the forecasts suggest a cloudy start to proceedings with rain moving in on Saturday and then the potential for some sunshine on Sunday. The difficulties of the Spa track are what make this one of the favourites of drivers and fans, old and new. The iconic Eau Rouge left-right sweep up the hill to a blind crest, the lengthy 7 kilometre track meaning conditions can be different at one end to the other, and the natural elevation changes all add up to make a highlight on the F1 calendar. Eau Rouge is, of course, the most memorable part of the track and it's the first real obstacle drivers face on completing a lap. The first corner is the hairpin at La Source, which drops away downhill before straightening up for the steep climb back up again. 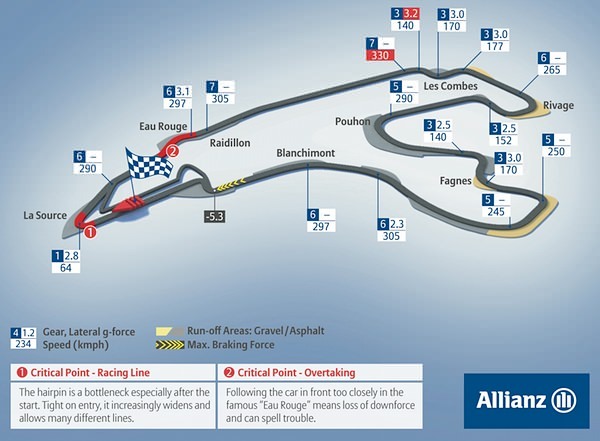 The track speeds up through the second sector, through chicanes and across the bumpy tarmac, before entering the final complex - a lack of straight track and a difficult chicane finish off the lap. Spa-Francorchamps has hosted the Belgian Grand Prix for 46 of its 58 outings, the others being at Nivelles and Zolder in the 1970s and 80s. The track used to be closer to the end of the season, but as more and more races have been added behind it, the race is now more of a mid-calendar treat. Ferrari are the most successful team to have raced at Belgium, with 16 wins to McLaren's 14. The Scuderia have won three of the last seven races, with McLaren and Red Bull scooping two each. Kimi Räikkönen also has a good history at the circuit, although Sebastian Vettel has had more recent good luck at Spa. One of the main problems or highlights of the Belgian race is that conditions are likely to be changeable. 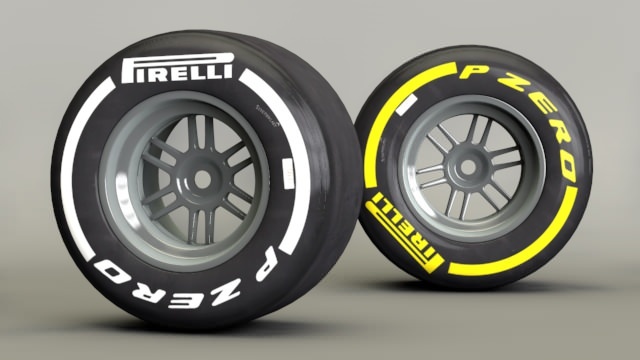 That can prove very difficult on the tyres, and although Pirelli have opted to bring the medium and soft compounds this weekend, we could very well see the intermediates and wets come into play. An adaptable tyre is the key element, able to work equally well within the very wide range of track and weather conditions that we often see in Belgium. Despite the fact that tyre wear and degradation is traditionally high at Spa – the result of the multiple energy loadings put through the tyres – we have been able to nominate the soft tyres here as well as the medium for the first time since 2011.